Generic connections: To facilitate the exchange of information between engineers, detailers, and fabricators about a connection between steel framing elements, Revit supports generic steel connections. You can place a generic connection to define the relationship between elements. Use parameters to supply information about the connection, including pictures and links to connection requirements or other information. Generic connections can display in drawings and use colours based on approval and/or code checking status parameters for an easier review/approval workflow. If required, you can later replace generic connections with detailed steel connections created using an add-in. 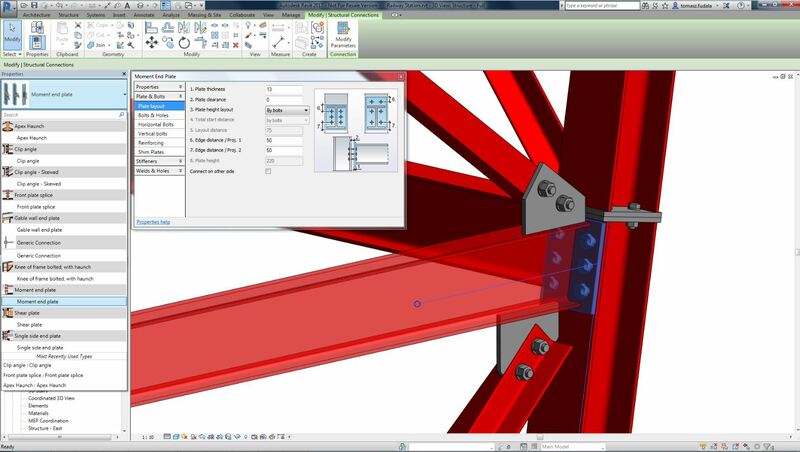 Steel Connections for Revit: This Autodesk add-in allows you to view detailed structural connector geometry and to modify additional parameters in the Revit modelling environment. Column base attachment: The Attach Top/Base command can now attach structural columns to isolated foundations and footings. Adjustments to the foundation height cause the length of the column to adjust accordingly. Structural foundation parameters: To achieve consistency and use more recognisable terminology, several reporting parameters have been renamed or changed for wall foundations, isolated foundations, and slab foundations. Isolated foundations: The Offset instance parameter is now Height Offset From Level. Elevation reporting: Top/Bottom Elevations parameters are now measured in relation to the Project Base Point. Elevation at Top/Bottom Survey: The Elevation at Top/Bottom Survey parameters for filters, tags, and schedules are measured by the shared Survey Point elevation. Reinforcement connectors: To improve reinforcement modelling and documentation, use reinforcement connectors. Reinforcement connectors are family-based and fully customisable, and each team member can use them according to their needs. Structural engineers can use schematic connectors to define requirements. Detailers can use them to produce shop drawings. 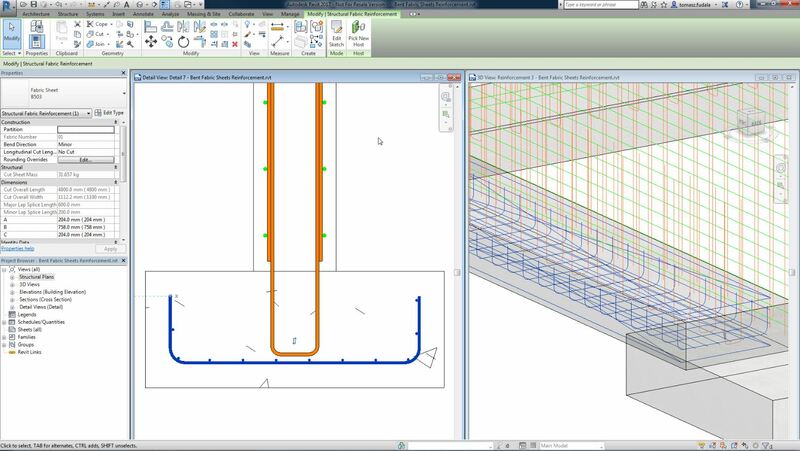 Manufacturers can go into full detail, precisely modelling and representing reinforcement connectors to create installation instructions. Rebar connectors interact with the rebar that they connect to, facilitating change management. You can add the connectors to groups, assemblies, and partitions with unique coupler numbering. You can also export connectors to various formats. Bent fabric reinforcement: When placing fabric reinforcement sheets, you can now sketch bent sheets to accommodate different shapes of concrete hosts. You can later edit them to adjust to any change. 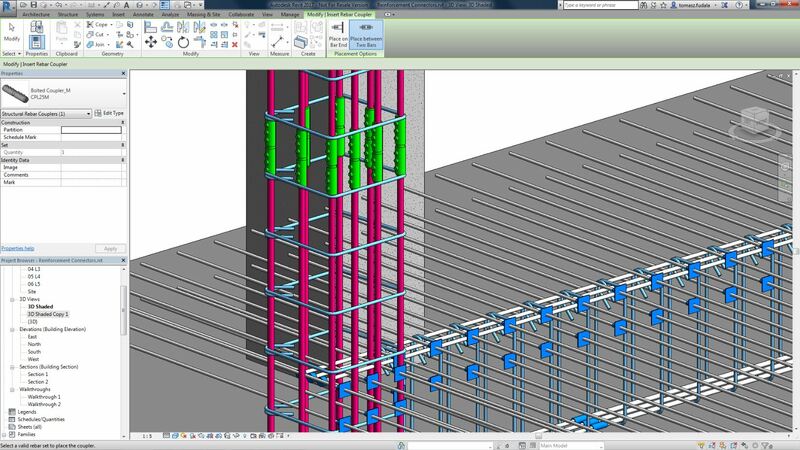 Constrained rebar placement: The new graphical constraints manager enhances precise rebar placement. You can place standard rebar shapes that snap to adjacent standard rebar, or you can constrain them to host faces. 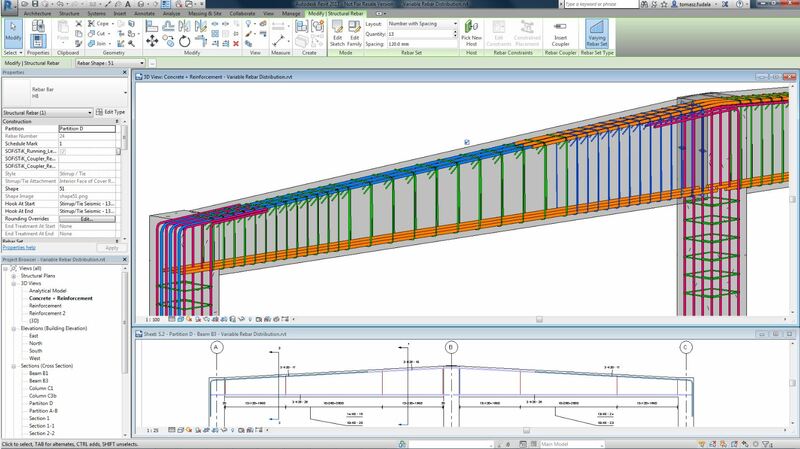 The user interface highlights each rebar segment that can be constrained, along with available targets. You can modify dimensions to adjust the rebar position. The snap constraint maintains its relationship when you place, move, drag, or copy rebar. Graphical rebar constraint editing: To improve the reinforcement workflow, a new in-canvas editor replaces the Rebar Constraints dialog. Variable rebar distribution: To fit rebar for complex shapes, you can use rebar sets that vary along inclined faces. Documentation is easy with multi-rebar annotations, customisable numbering settings, and accurate schedules that display varying lengths. You can also define inclined rebar sets. Revit – Robot Integration: Using the Revit – Robot link, you can transfer to Revit the new result for required reinforcement: transverse density. You can display diagrams of transverse density using Results Explorer.